The Eventing Cross Country Course and XC Obstacles are an endurance test for both horse and rider. The professional cross country course is approximately two and three quarter to four miles long. It should contain twenty-four to thirty-six fixed and solid xc obstacles of mixed variety and the course should be ridden at a good gallop. Cross country courses require both horse and rider to be bold and smart. 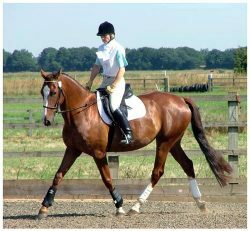 They test stamina as each horse and rider combination must be fit to ride and complete all four phases in the correct order; on time and with as few penalties as possible. In Olympic and World Championship competitions the total mileage covered in the speed and endurance phase can be up to twenty miles. The cross country phase appeals most to spectators and riders alike. It is the ultimate challenge for an event rider to prepare a horse for this rigorous test. Unlike other sports, where only the humans will and body are pitted against the clock, in eventing or combined training two minds and bodies have to work as one. As an additional attraction, equestrian eventing is the only high-risk Olympic sport that permits men and women to compete as equals. There are no separate divisions and some of the top riders in the world are women. At the advanced level, cross country fences can be 3’11" (1.19m) high, with up to a 5ft 11in (1.80 m) spread at the top and 8’10" (2.80m) spread at the bottom of the fence. Fences with no height (i.e. ditches) can be up to 11’10" (3.95m) wide. Brush fences can be 4’7" (1.85m) at the top of the brush, and drops can be up to 6’7" (1.95m). There are between 32-40 jumping efforts on a cross country course that is 3000-3800 meters long and the advanced level cross country course is ridden at an average speed of 570 mpm (meters per minute). Local cross country courses vary in length, difficulty and obstacle heights. Most course owners incorporate their obstacles into limited land and around fields that are either grazed or part of a working farm. 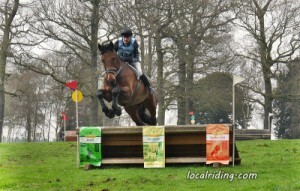 The local rider should not expect a local cross country course to come up to the standards of the large televised event courses, such as Badminton or Burleigh. However, there are some very good local courses around and most can be enjoyed by the novice rider, the up and coming eventer and the experienced horse and rider that look forward to a good day out jumping, with the minimum of risk. Manor Farm cross country at Howden in South Yorkshire is a good course local to us and we have ridden over the course on our six year old novice horse Primrose Hill IV, without a problem. The course has quite a nice water complex which introduced Rosie to popping in and out of the water and the lemonade and cakes provided by the owners was a welcome treat at the end of a good day. 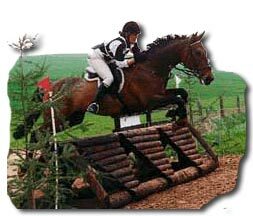 Similarly, Danethorpe Hill cross country course, near Newark is a good course for the beginner or experienced rider and a day out jumping the novice course on a horse you are bringing on is a real treat. Cross country obstacle heights and jumping them safely. 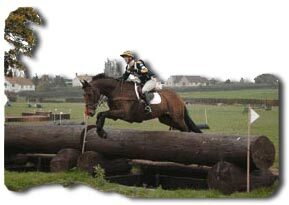 For affiliated cross country obstacle heights and what to wear, see the equestrian eventing cross country page. For riders attending local cross country courses for a leisurely or enjoyable day out, two simple things should be uppermost in your mind. 1. You and your horses safety. Safety is paramount and you should ensure you are properly dressed for cross country jumping. Remember, you and your horse may get more excited and attempt more than you would normally. So be prepared for the unexpected. Do not ride a cross country course alone. Have someone with you either on foot or another rider. Wear a riding hat that meets or exceeds all current safety standards. Wear a good quality body protector. Wear a long sleeved shirt even if its warm. Ensure your horse is wearing boots. Ensure you are wearing riding boots. Ensure the course owner is aware of your experience level. Make sure you have the correct insurance cover in place. 2. Are the cross country course and xc obstacles suitable for you and your horse. Only you know your experience level and you are the best judge of whether your horse is able to attempt a full course of cross country jumps. Be honest with yourself and do not be pushed into doing more than you think you or your horse are ready for. Yes… sometimes you need to push yourself or be pushed to achieve more and move on, but think carefully and assess the cross country course before you fully commit. Visit the course before you take your horse there. Check the quality of the ground. Check the obstacle heights and distances. Check the water complex, if there is one, for depth and footing. If in any doubt arrange a training day on the course, with a qualified instructor. Tulasi will become the buy online accutane most sacred of all plants dear..